On April 4th, 2014, the history of fitness was forever changed when Jordan Feigenbaum spoke to a group of interested barbell training partisans at Saint Vincent’s College in Latrobe, Pennsylvania. Formerly know only for its watery beer, Latrobe became that day the hotbed of cutting edge strength training. 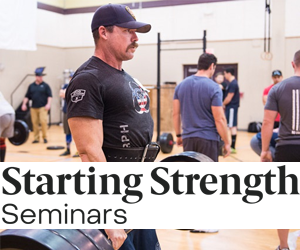 Hosted by Starting Strength Coach Nicholas Racculia, Professor Feigenbaum presented more valuable information in a short one-hour session than is available in most textbooks. And you are now privileged to watch and learn too. That was really great - send it to a bunch of lanky Danes already. I do wish Jordan would dress more classic like Joe Ladnier though. Well done. I'll run this by my cardiologist buddy who trains for triathlons to see if it gets him on the strength bandwagon. 1. Penn State is not the closest med school (and their med school isn't even in State College), Pitt is much closer. 2. Rolling Rock is crap, but St Vincent has hosted more than a few notable groups of strength athletes - the 1970s Steelers, like Mike Webster (and all the Steelers since) for training camp. Watched it, was very good. Is this also posted on youtube by any chance?. Question on HIIT versus LISS cardio. Since HIIT is by its very nature intense, wouldn't doing HIIT be harder on recovery?. Meaning that since strength training is also intense, adding additional intense training increase the need for more rest and recovery?. A faster build up or cumulative effect on the need for recovery?. Wouldn't lower intensity "exercise" be more beneficial for fat loss and recovery from the stress induced by intense training?. 1. Penn State is not the closest med school (and their med school isn't even in State College), Pitt is much closer.. While I knew Penn State Med is in Hershey (not State College), I forgot about Pitt. Admittedly, I'm a midwestern guy so try to not hold it against me. HIIT is likely to be transiently "harder" on recovery, particularly for those who are untrained. To be honest, for the untrained population- doing anything will likely compete with recovery and this is one of the reasons we prefer to have people not do conditioning work whilst on the novice progression. That being said, HIIT actually tends to improve work capacity and recovery capacity (two trainable factors) in a more expedient manner than LISS, AND HIIT doesn't compete with strength training for improvements in force production. The same cannot be said about LISS, as the adaptations produced by "cardio" are diametrically opposed to strength training in anyone outside of the most decrepit population. LISS can be used as an active recovery modality, though it is less effective than HIIT if the goal of active recovery is force production (strength or power). Your slide presentation and the bibliography you refer to, any chance those are available to download somewhere? Also, dear Lord, they did resistance training and HIIT studies on people with AAAs?? My jaw dropped when you said that. Gutsy researchers, but that's awesome. Do you happen to have a bibliography handy? Excellent talk, by the way. Really excellent.